HomeSword staff. The sword of the poor! Sword staff. The sword of the poor! 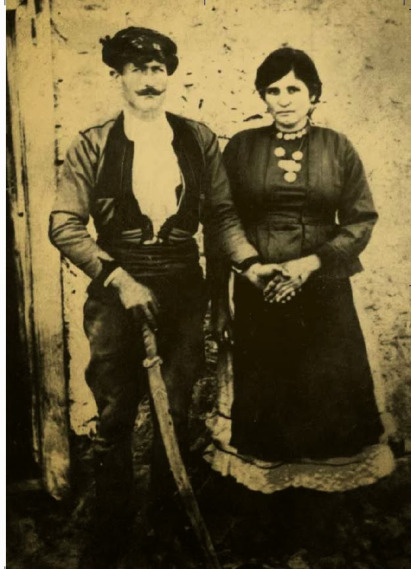 Michael Zachariou Charonitis and his wife Theonimphy and with his sword staff in hand. Once upon a time in Byzantine Empire, the wooden swords were used in common as weapons, from the time of the legendary Byzantine hero Basilios Digenis Acritas until the present days, this tradition kept alive. Behold the weapon of the poor people of Crete; it is a medieval tradition that’s fades away in the dawn of the 21st century. 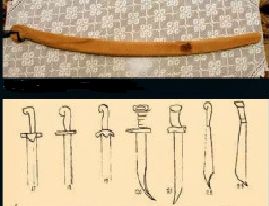 The sword staff or sword stick is a staff with the shape of a curved sword; actually it is a wooden sword. This wooden sword is not a training sword such as boken, instead it is a strong wooden construction which made from a thick and hard type of wood. This brilliant symbol of a world which fades away, the sword staff is hiding all the power of Crete and all the ignorance of our age. 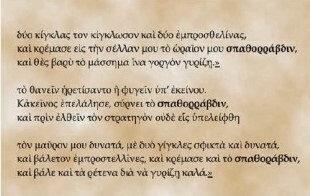 In few decades the most popular weapon of the rebels of Crete was forgotten even as memory. The sad of all of this matter is that this weapon has its roots back to the medieval empire of Greeks. The Eastern Roman Empire! The sword staff is exactly what it is the meaning of its name. It is a staff, with the shape of sword. It is a wooden sword. But it is not a replica of sword or a training weapon or even a game for the kids but instead a strong construction made from thick and hard wood as you see above. The sword staff was no tall the same. The wielder was also its creator and he made it as he wish. This type of weapon has a sharp edge! This edge is extremely sharp and it can mortally injure the duelist’s opponent. This edge can injure the flesh, it can also break the bones and the primary target of this weapon is the head and secondary target the arms and the fingers. The grip of this type of sword has notches for the fingers of the wielder and some of them are flat. 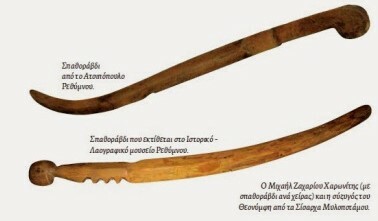 This forgotten weapon was popular in all Crete and it was in use at the mountain area of the island. Many people had this weapon with them when they visit the local village’s cafeteria until 1960! 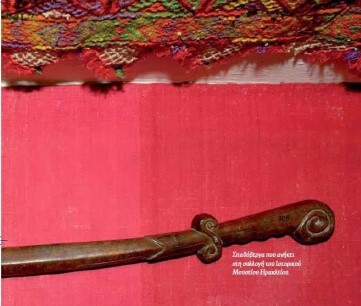 This weapon and also the weapon called ‘hurhuda’ (a long staff with a knob at one point, it is like long club) were the fundamental weapons of the people of Crete at the Ottoman Empire occupation and especially before the firsts rebellions against them. This sounds odd because in the museums we can see only the brilliant swords of the Greeks war captains of the rebellion and we thought that also the rebels in Crete used the same type of weapons. In other words we imagine that all the rebels use expensive swords and full equipment against the army Ottoman Empire. But the true was much different. The rebels were ready to fight and die with their poor equipment but they had in mind only one thing, to win the Ottomans, and the price of freedom. They thought also that they start the rebellion with poor equipment and then they are going to be equipped well from the looting of their enemies from the battlefields. At Ottoman occupation and especially before the rebellion of 1821, the people of Crete were poor and in economical strangle. As a result they can not buy war equipment. The fire arms and also the swords were too expensive. Even the reach people have not enough money to equip the men of their family clan. From the other hand if a Greek family was reach enough to equip its clan members with weapons; it was a very difficult situation, because the Ottomans control all the weapon stores and also the material which used to construct weapons. Also the Ottomans do not allow the Christians (Rum millet) to use weapons. If some one wants to get swords or fire arms, he must find a way beyond the island and off course to act against the Ottoman law. The Ottomans controls all the sea roots so it was impossible to found weapons on those years. Only some people from the region of Sfakia could bring weapons in the island with their boats as smugglers and off course with the fear if the Ottomans catch them. The Christians had not even allowed bringing knives. Only the Muslims allow having those weapons, and they construct them in the large cities of Crete from Muslims weapon smithers. As a result of the above situation it is extremely rare to see weapons of Christian origin until the age of 1870. Even when the law about the occupation of weapon had changed, the situation does not change. A north European traveler who had visit the Crete at 19th century, he wrote in his book that he saw villagers that they had only one type of weapon each of them and it was the sword staff and some of them had wooden spears. For all the above reasons, if someone wants to have a weapon he had to construct it by himself. The problem was that the iron was extremely rare in Crete, so the common people of Crete cannot made weapons. But for many reasons the people need to have weapon for self defense. So they found the way to make weapons of wood and that was the sword staff. Each one constructed the weapon alone and also creates beautiful glyphs or even prayers upon them. 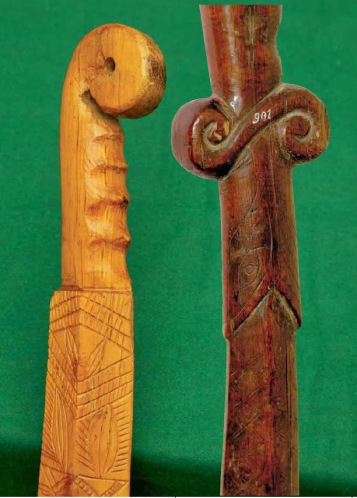 Other people made only a simple staffs named ‘hurhuda’ and they gave this name to this weapon from the sound that it did, as it cuts the air ‘hur-hur’. The construction of these weapons is an ancient tradition of Crete from the people who made things from the wood. Except of weapons in Crete there also too many wooden ‘engines’ who use wooden gears! The oldest source we have about the sword staff is from the books of Digenis Acritas at 1100. We have paints from the book of Skylitzis that appears swords which are like sword staff but we are not sure if the blade was made from wood or metal. The oldest information we have about the sword staff we have it from the books of Digenis Acritas at the age around 1100. At those books the sword staff of the hero was used from him many times, so we understand that this type of weapon it was in use from medieval time (and probably older) and it was used also as weapon from professional warriors such as the Acrites. Also we have paints from the book of Skylitzis that appears swords which are like sword staff but we are not sure if the blade was made from wood or metal. 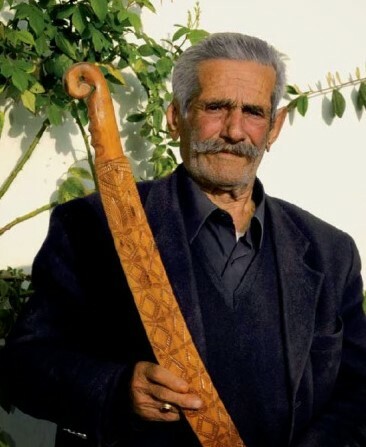 Hercules Parisinakis was one of the last sword staff makers. 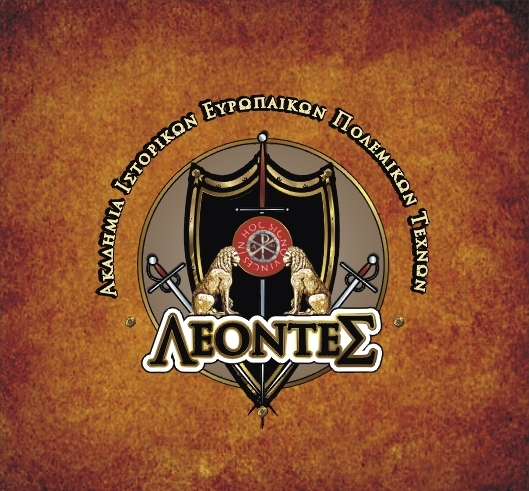 At the last 10 year we are trying to collect information about the sword staffs of the Crete. On this research we were spot the last living makers of these weapons. They were two. 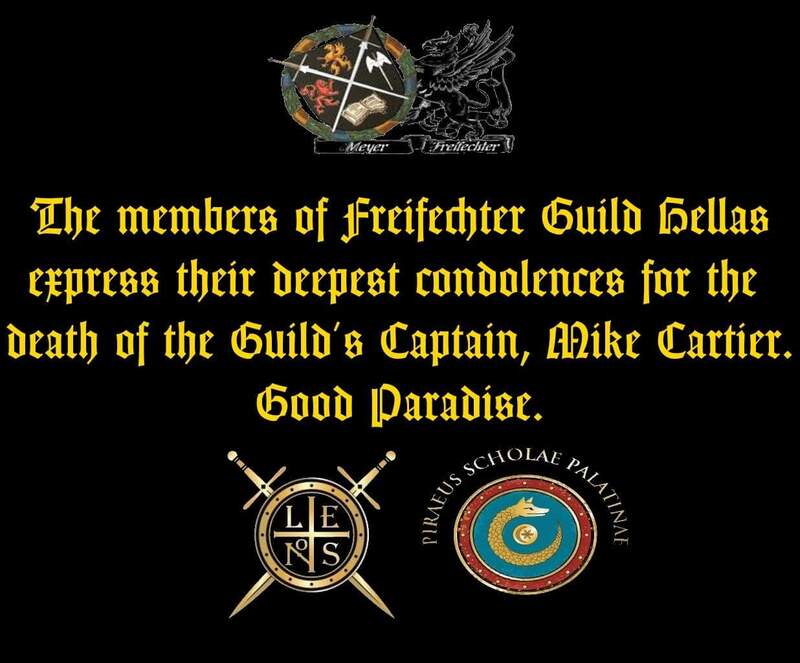 Unfortunately both of them they pass away some years ago. 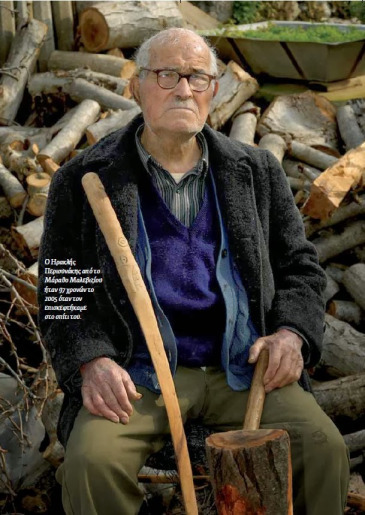 Hercules Perisinakis was 97 years old when we had visit his home at village Maratho of Malevisiou back to 2005. He had made sword staffs and he sells them to the local stores of the village and at Heraclion city. The other one named John Polichronakis from Mizorouma he made also sword staffs and he passed away before give his art to the new generation. John Polychronakis was one of the last sword staff makers. At our days this common weapon of Crete is going to disappear. We can meet this type of weapon at some collectors and at the Folk and Historical museum of Rethimnou and the museum of History of Heraclion. After the kill of three Janissaries, the people of the Anogia village start the rebellion against the Ottomans. They start their training in sword fight and all the male villages made wooden swords and wooden staffs called Hurhuda. With theses wooden weapons they had start the fight against Ottomans and then they loot their enemie’s weapons to continue the rebellion. Except in Greece we can see wooden swords at the medieval Europe and also at Renaissance. Those types of sword were used as training weapons (see Dussack) but also as real weapon for those who cannot buy a metal sword. At medieval Italy groups of young man fought each other with wooden swords and shields. On those conflicts they had serious injuries and also deaths. At Venice of 14th century until 18th century thousand citizens take place at the event which called ‘Battles of Bridge’. It was an extreme violent sport. The goal of this ‘battle’ was that the one team must win the other team and occupy the bridge. All of them they used wooden swords. 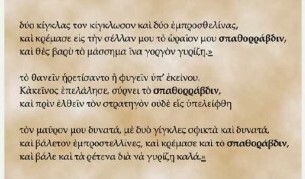 –Basilios Digenis Acritas was a legendary Medieval Greek hero. The nickname ‘Digenis’ means he who has two origins. His mother was a Greek princess of the Byzantine Empire and his father was Arab prince. With their marriage (after the Arab prince became Christian and citizen of the empire) they had their offspring named Basilios. From early age he made many deeds. He killed a lion with bare hands when he was a child and many others. His greatest achievement was that he had a duel with the ‘Death’ at the Marble Halls (the gates of Hades). In this duel he faced Death with his sword at hand, and he won the Death but after that Basilios pass away from a disease. His last name Acritas, was not actually his last name but a name of type of warriors that gives the empire to the men who protect the borders of the empire from the enemies. The meaning of the word Acritas mean border man or ranger. Off course Basilios Digenis Acritas was not a true person, actually on this myths we learn the spirit and the bravery of all Acrites of the empire. They protect the villagers from the bandits, they protect the borders from foreign invasion, but always they were few. So they fought with bravery and cunning and with hit and run tactics.